In a previous blog post of ours, we looked at Traffolyte and how Traffolyte signs are created. They are a popular form of engraving technique for electrical signs and are also used for safety signage. There is also another form of engraving which is popular: anoprinting. In other words, anoprinted signs. The first three letters of anoprinted [ano] refers to anodised aluminium. Anodised aluminium is a strong, hard wearing material. This makes for a good engraving material, which is popularly seen on engraved plaques, door signs, and for denoting model or serial numbers. Anoprinted signs, along with their Traffolyte equivalents, are suitable for safety signage. Especially in heavy duty environments where doors and machinery take a lot of stick. We at Able Engraving and Design are able (so to speak!) to offer anoprinted and silkscreen printed safety signs for your workplace. 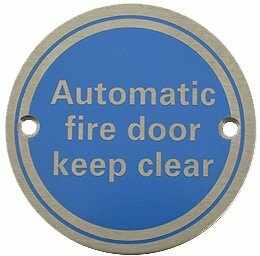 Our anoprinted signs are available in anodised steel, aluminium, and brass varieties. If you have any queries about our anoprinted and Traffolyte safety signs, why not give us a call on 01342 843211, or send us an email to sales@able-engraving.co.uk. We will be delighted to be of service. Able Engraving and Design, 12 April 2017. This entry was posted in Able News and tagged anoprinted, etching, printing, safety signs, Traffolyte on 12th April 2017 by admin.